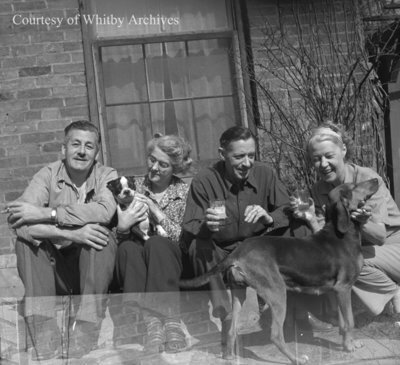 A black and white medium format negative of Mr. MacLeod sitting outside with his dogs and three of his family members. In this view from left to right: unidentified man, unidentified woman, Mr. MacLeod, unidentified woman. Mr. MacLeod and Family, April 1945, Marjorie Ruddy. Whitby Archives A2013_040_435.